I first heard of Nigel Biddlecombe, this book’s author, a few years back when Weymouth FC seemed to be in a bit of a crisis. Despite having lived here a few years I’d paid scant attention to the Terras, as the team are known, but early in Olympic year Biddlecombe jumped from life-long fan to club owner. This book pre-dates that excitement, being published after the 2006 season (the last that it covers). It’s surprising that there is any history to document. In his forward Biddlecombe says the club records were destroyed twice, once during the Second World War and again more recently. Despite this handicap, he’s put together a story that begins in 1890 when Mark Frowde, Robert Bennett and Jimmy Newport decided it was time the town had a club. 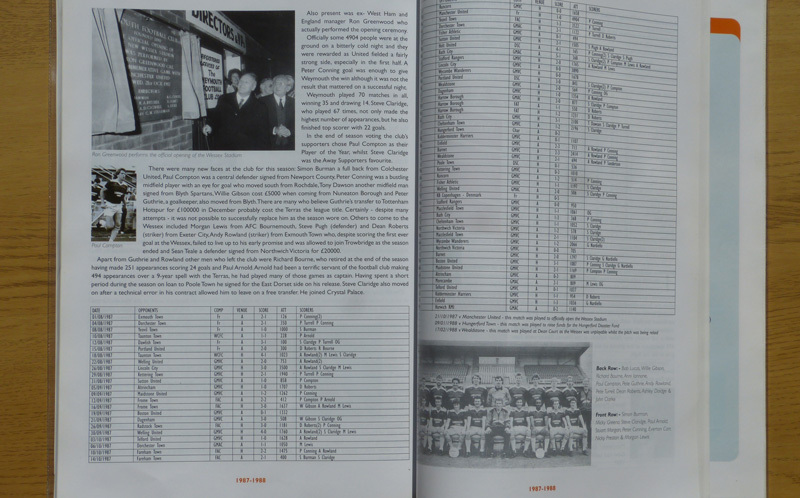 This history provides a summary of every season and statistics for each game, right back to the first match on 24 September 1890, when Mr Pope’s XI took on, and were beaten by, the new town team. Their colours, terracotta red and pale blue, apparently were copied from the town’s Jubilee clock, a seafront landmark. Around the time the team was being formed, the council had awarded a contract to repaint the clock in these colours. The team’s nickname, the Terras, comes from the choice of the terracotta red colouring. 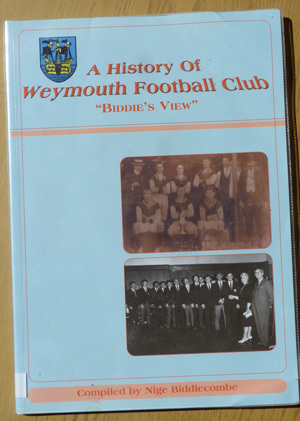 In addition to charting Weymouth FC’s history and characters, Biddlecombe’s book also provides some insights into the grounds where they played in Weymouth, first the Recreation Ground and more recently the Wessex Stadium (now the Bob Lucas Stadium). There’s also a fascinating insight into the popularity of local football teams before the First World War. Weymouth FC has long outlived other teams from the area, such as Portland Wanderers, Whiteheads (from the torpedo works at Ferrybridge) and Weymouth College. The book is a private publication that I found in the Wyke Regis library. When I find a copy to buy, I’ll add it to my local history collection.